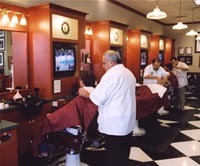 V's Barbershop is an authentic, old-time barbershop offering traditional barbering services in an upscale and uniquely masculine environment. Haircuts, old-fashioned straight-edge shaves, facials, and complimentary shoe shines. Our concept is simple: a real barbershop for real men. Unconsolidated Industry - Our competitors are largely made up of "mom and pop" shops and low-cost, convenience, salon-style shops. Fully Developed Concept – We've got a proven system for maximizing sales and streamlining operations. Best of Class – V's has been very successful in attracting and retaining the best barber talent in the industry. We provide that same support to you. Training – You'll receive a week of on-site training plus 3 separate step-by-step manuals on how to open and operate your shop. A Team of Experts – The V's management team have a combined 50 years experience in the barbering industry and another 40 years experience in business management and consulting. We're here to help you. It's a Barbershop! A business investment has never before been this fun. "Consider an afternoon at V's...Welcome to the new American barbershop—still a place to get your mop chopped and jaw about sports, but updated with higher-end services and all the comforts of a great sports bar or an exclusive men's club." Remember the old-time barbershop where Dad took you when you were a kid? By now most of them have vanished. We've had thousands of guys tell us the same thing: "Until V's, there were no good choices." We've created a concept and an environment that men enjoy. From the real barber chairs to the hot lather old-fashioned shave and the relaxing massage you enjoy before you leave, V's has brought back the best of the old and set a new standard for men's barbershops. Your customers will love the classic, old-time feel of their neighborhood barbershop. You'll love that growing your own business really means hanging out with the guys. And you don't have to be a barber! A man who has never had a professional barbershop shave simply doesn't know what a close shave truly means. The traditional hot towel, face lathering, straight razor shave is to a gentleman what a good facial is to a woman—a relaxing skin-pampering treatment. The newest place for an uptown guy to get a good shave ..is downtown at V's Barbershop...It is the perfect alternative for the guy who is tired of the swivel chairs, feminine chit-chat and the $30-cut-plus-tip involved at most beauty salons." Continuous growth – No matter what the economy looks like, hair keeps growing! Consistent cash flow – On average guys get a haircut every 4 weeks. It's predictable. No waste – Unlike a restaurant franchise, nothing spoils. Underserved market – Guys currently have no good choices for hair care. There are approximately 110 million men in the U.S. and they all need a haircut! Newspapers, magazines and television networks are already reporting on the success of V's Barbershop. The end result is powerful brand recognition that delivers dynamic results for our franchisees. V's has been featured in Men's Journal, A&E Television Network, Sunset Magazine, Foothills Magazine, Scottsdale Magazine, KTVK Channel 3, KPHO-TV (CBS) , KSAZ-TV (Fox), Where Magazine, Launchpad Magazine, Item Magazine, Phoenix Bride & Groom, Arrowhead Life and many others.